A crow has retrieved a fallen fetish from the forest that was lost by Master Splinter and has carried it to the city, where it lands on Saki’s windowsill and taps the glass. Shredder is amazed at the birds appearance and the fact that Splinter has lost possession of the artifact. The bird continues to tap, annoying the Shredder – until it explodes and destroys the window. Meanwhile in the sewer, the Turtles lay their fallen brother on a bed and prepare him for a ceremony. Master Splinter summons Animus, who is angry yet intrigued by the creatures that he faces. Splinter asks Animus to heal his fallen student, but Animus feels no kinship with the mutants and leaves. Shortly thereafter Saki finds their lair. 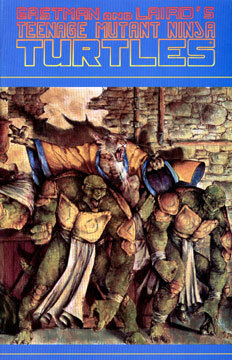 Splinter commands the Turtles to kill the intruder, but Shredder has little trouble besting the TMNT in their hibernated state. Then, to everyone’s surprise, Shredder makes the attempt to heal the fallen Turtle. “The rest is a matter of will. Provided, of course, the beast has one.” Shredder states as he prepares to leave the Turtles sanctum.